The stone reads: Sacred to the memory of William Dalziel, Surgeon, RN, who died at Wigtown on 9th day of November 1833 aged 45 years. And Marion Ferguson, his wife, who died 26th day of January 1839 aged 54 years. And of Marion Ferguson Dalziel, their daughter, who died on the 17th day of June 1836 aged 1 year and 5 months. 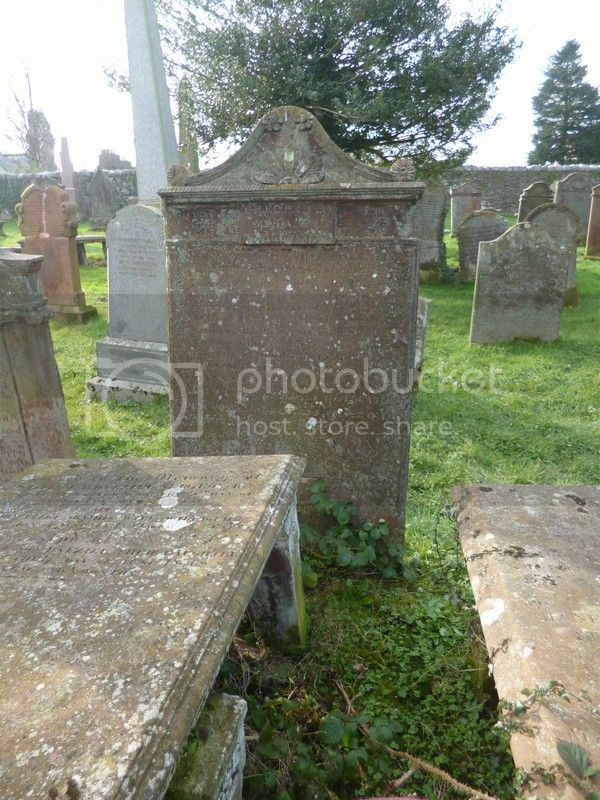 The gravestone reads: Erected by WA Dalziel, surgeon, RN, in memory of his father, John Dalziel Esq, late writer of Wigtown, who died 14th Feby 1813 aged 48 years. Also to John Hannah Dalziel, Surgeon, RN, his brother, who died on board HMS shp Batavia at Woolwich, March 21st 1816 aged 28 years. Not sure how military this is, but it's certainly unusual. John Black Cameron, Knight of Dannebrog. Apparently it is a Danish honour of some type which can be awarded to individuals from the military. 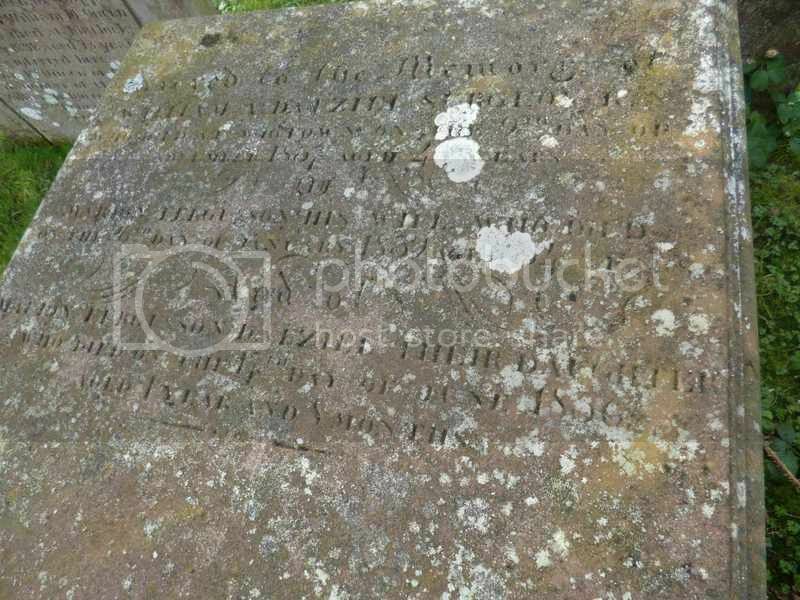 The gravestone reads: Erected in memory of Thomas Roy Cameron, who died 20th July 1849 aged 27 years. 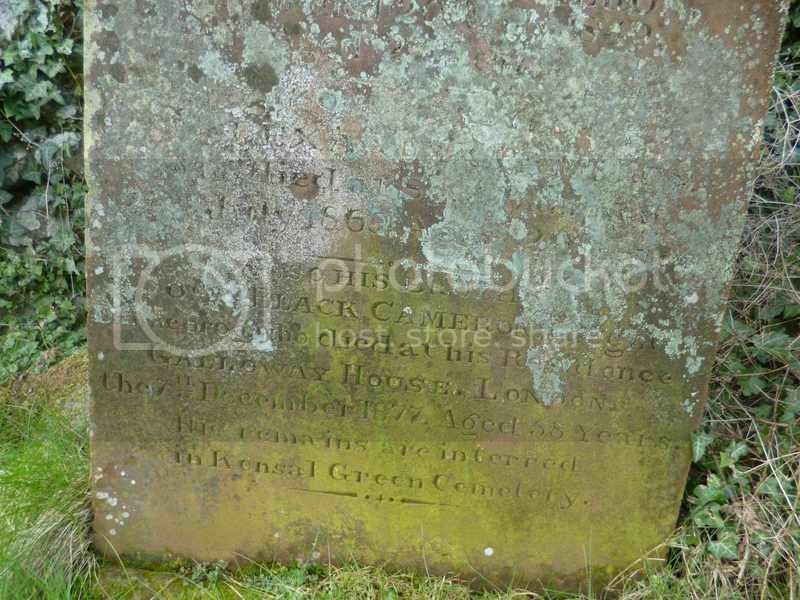 Also his brother Alexander Cameron who died at Southampton 20th July 1869 aged 29 years. Also his brother John Black Cameron, Knight of Dannebrog, who died at his residence, Galloway House, London, the 7th December 1877, aged 58 years. His remains are interred in Kensal Green Cemetery. Edit: The ever-reliable Ken Morrison has come up with a plausible explanation for the "knighthood". Apparently John Black Cameron was the Superintendent and Agent for the Royal Mail Steam Packet Company on the island of St Thomas in the Danish West Indies. I'd never heard of the Danish West Indies: they are now the US Virgin Islands as they were sold to the US in 1917. Here's a possible for The Peninsular War. 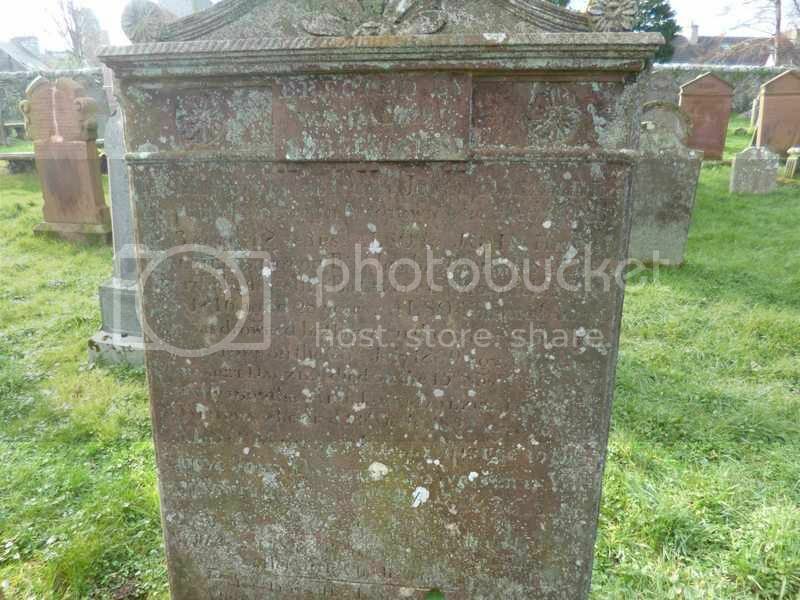 The gravestone reads: "In memory of James Mordoch who died the 24th of Feby 1816 aged 80 years. Also Mary McKie, his spouse, who died the 2d of Jany 1808 aged 50 years. Also od the two sons both called James, died in their infancy. And also of William Coulter who died in Villa Franca, in the Province of Gallicia, the 16th of Feby 1809 aged 21 years. Also Susanna Mordoch, wife to John Coulter, who died 11th Nov 1844 aged 78 years. Also Margaret Coulter who died 13th Jany 1850 aged 52 years. Also Elisabeth Coulter, spouse to David Cowan, who died 10th May 1856 aged 60 years. 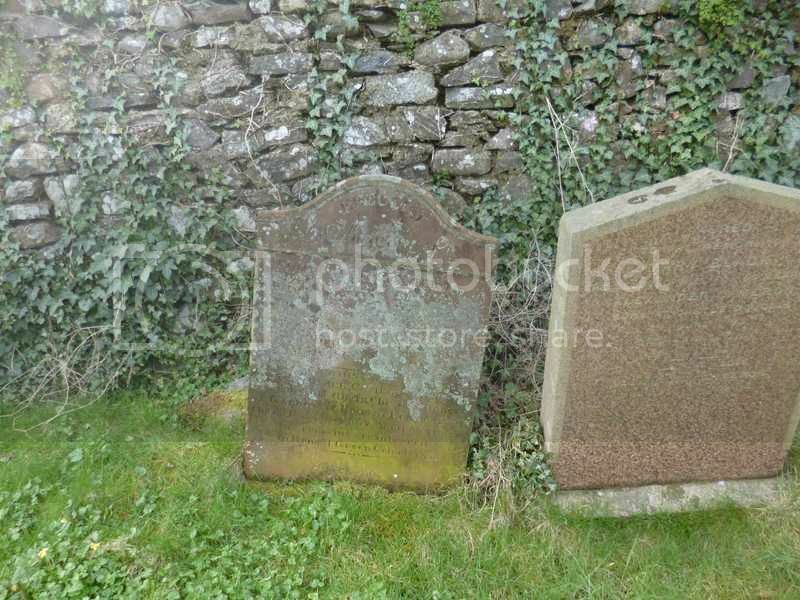 Also their son Edmund who died 22nd Augt 1829 aged 18 moths." I am interested in William Coulter Mordoch who died at Villa Franca in Gallicia, 16 February 1809 aged 21. The Gentleman's Magazine and Historical Chronicle for 1809 gives an account dated January 5th of a hospital at Villa Franca with 300 English sick and wounded. Also the routing of the English at Villa Franca by the French army under General Merle. I can't think of any other reason why a 21 year old should die at Villa Franca at this time other than being a soldier. Any thoughts? A little more on the Mary Frances Cunninghame Davis who I was intrigued by on the John Davis grave. A quick Google search reveals of British War Medal up for sale back in 2015 for this lady who served with the QMAAC. Entries in the London and Edinburgh Gazettes pre-war confirm she was a telegraphist. I must dig some more! With some help from Ken Morrison we now have the background to Mary Frances Cunninghame Davis. Moved to Wigtown when her father died and became a Post Office assistant, then a telegraphist. Served with the Queen Mary's Army Auxilliary. Rank: Worker. Service Number: 9527. Served in France. Service period: 24/11/1917 to 8/8/1918 when she was discharged as medically unfit. Died 18/7/1920 at Continuation Hospital of Pulmonary Tuberculosis which she had suffered for 2 years. Normal address Quarriers Village, Bridge of Weir. Unfortunately there is nothing to link her war service as aggravating or causing her TB so unlikely to progress as a Non-Comm. 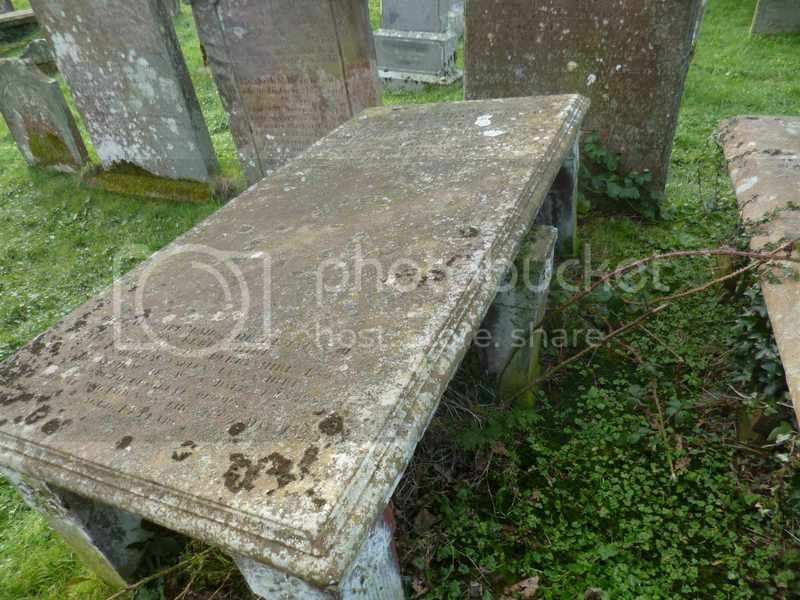 The grave stone reads: Sacred to the memory of Sarah Muir, wife of David McJerrow, Wigtown, died 22nd July 1863 aged 69 years. Also the above David McJerrow who died here 8th January 1871 aged 74 years. Also their son David McJerrow, Solicitor, Annan, who died there 30th May 1877 aged 50 years. Also their daughter Helen McJerrow who died 10th July 1883 aged 57 years. Also their grandson David A McJerrow who died at Detroit, Michigan, USA on 3rd April 1895 aged 28 years. Also John, their third son, who died at Brooklyn USA on the 5th July 1898. Also William their second son who died here on 31st October 1899. Also Magdalena McMaster, wife of the above William McJerrow, who died here on the 13th September 1902. An internet search revealed a family history page which includes reference to a letter from the 1920s in which the writer provides her knowledge of her forebears. She mentions John McJerrow as being a "rolling stone" who fought in the American Civil War for the Northern states. She even met him, describing him as: a tall, athletic "rugged-looking man" who reminded me of pictures of ... president Abraham Lincoln. " US Civil War Soldier Records and Profiles. John McJerrow. Enlisted: 2/11/1863. Birth date: 1833. Age: 30. Residence: Massachusetts. Occupation: Porter. Rank: Private. Was wounded? : Yes. Survived War: Yes. Service record: Enlisted with Company A, Massachusetts 56th Infantry Regiment on 26 Dec 1863. Mustered out on 12 July 1865 at Alexandria, VA. There is an entry in the records of US National Home for Disabled Volunteer Soldiers in Milwaukee. He was admitted to the hospital in December 1868 as a result of gunshot wounds to his right shoulder and leg. He appears to have discharged himself 20 months later but readmits himself on two more occasions . John McJerrow was born Wigtown, the son of master baker David McJerrow.